CORRECTION: When we first published this article on June 18th, the full team that worked on the MOXI museum was not represented. We sincerely apologize for the mistake. Please read the updated article with the corrections. Image 1: Aerial photo of Moxi Musem taken by Gani Pinero. MOXI, The Wolf Museum of Exploration + Innovation, located in Santa Barbara, CA, is the first LEED Gold certified museum in Santa Barbara County. As part of the design team, T&S worked closely with the architect, AB Design Studios, to develop a creative and efficient structural system comprised of concentric braced frames, moment resisting frames, reinforced masonry shearwalls, and exposed custom steel trusses. One noteworthy design element was the 720 square foot glass floor deck at the rooftop which we supported with long-spanning steel tube members designed with aesthetics in mind and exposed to the courtyard below. The museum opened just over a year ago and their mission is "to ignite learning through interactive experiences in science and creativity." 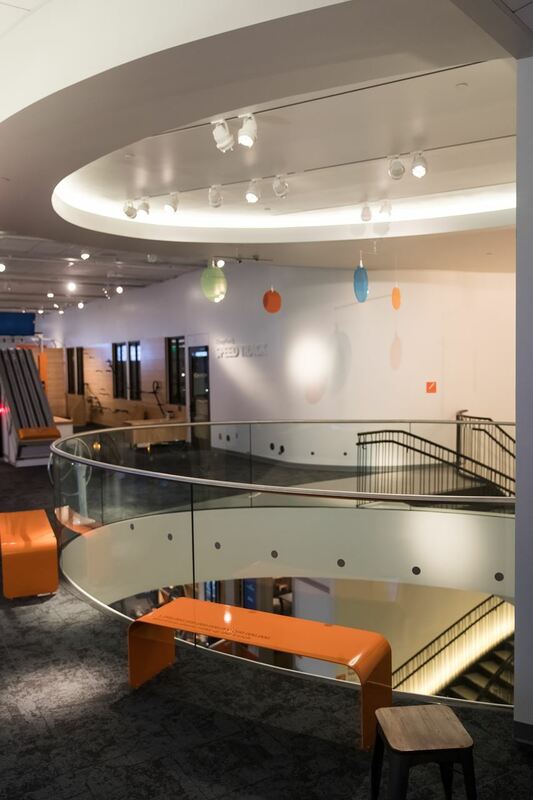 Visitors are encouraged to explore and play through highly interactive exhibits designed for science, technology, engineering, art, and math (STEAM) education. 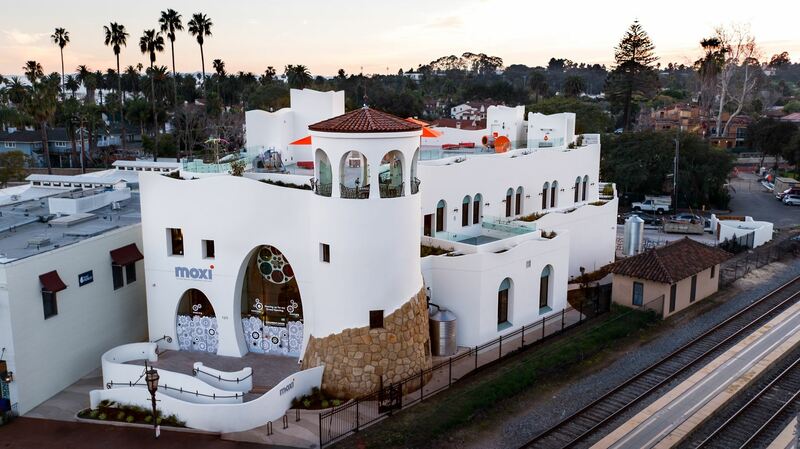 As Santa Barbara’s newest hands-on destination for families and curious minds of all ages, MOXI is a place where you can explore and discover new things about the world around you, ask questions, seek answers and have a blast doing so. Lighting Design: Ann Kale Associates, Ltd. Mechanical + Energy Consultant/Modeler: Mechanical Engineering Consultants, Inc. 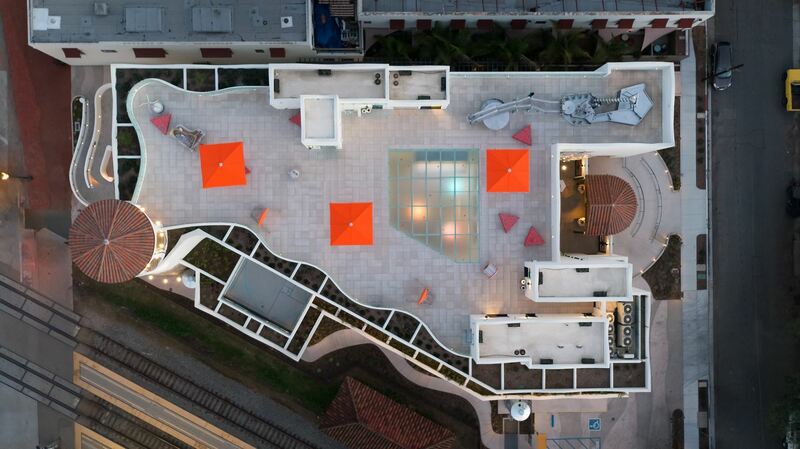 Image 2: Aerial photo of the interactive Moxi Musem roof taken by Gani Pinero. The concept of resource efficiency is applied to every part of the building. Green practices are visibly demonstrated throughout, including a range of day lighting and LED lighting systems, landscaped concrete planters, a cistern for collecting rainwater, and energy-efficient, structural glass in facade openings. The facility implements a range of energy-efficient lighting and day lighting strategies, surpassing Title 24 by 26.8%. In addition, a purchase of 70% renewable energy certificates supports energy source research and development. Strategically placed, generous windows provide access to natural light and views, and a glass floor section of the rooftop allows daylight to penetrate the innermost areas of the first and second floors. Interiors feature highly efficient plumbing fixtures to reduce indoor potable water use by 42%. During the construction process, 89% of all construction waste was diverted from the landfill. The site soils had potential for liquefaction due to a high groundwater table and subsurface land layers. In lieu of a deepened pile foundation system, an efficient concrete mat slab foundation was chosen to provide the required strength and stiffness to support the building loads and limit differential settlement. The need for large open spaces to accommodate future exhibits dictated an open floor plan. For structural efficiency, the long-spanning steel framing members were designed as composite beams (integrated with the concrete deck) which allow us to use lighter steel section while also limiting floor deflections. The curved staircase near the entrance of the building was designed with custom rolled HSS tube stringers, computer modeled to ensure strength and performance at this critical element of the structure. Image 3: Curved staircase designed with custom rolled HSS tube stringers. 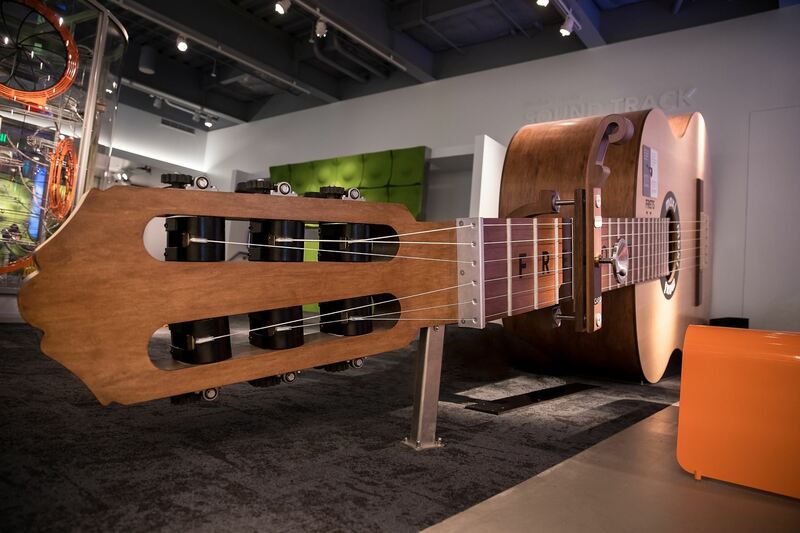 Image 4: Giant guitar to help visitors learn about music and sound. Although the team faced many challenges, that didn't stop them from creating a space that was well designed, sustainable, and kept the kids and families in mind. 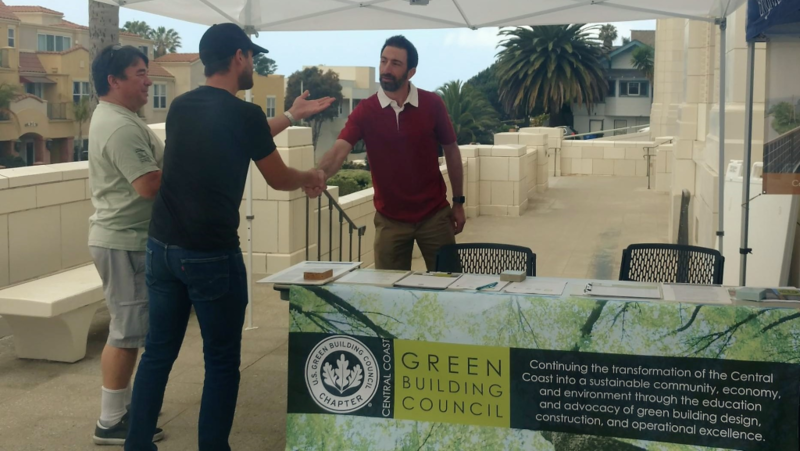 On June 16th, the City of Ventura Community Development Department and Environmental Sustainability Division hosted a Ventura Strong Re-builds Green Expo at the City Hall in Ventura. Hundreds of residents affected by the Thomas fire and flood gathered to learn about green building approaches, design technologies and utility rebates and incentives that they can implement. CCGBC was just one of the organizations among the handful that came out to support and provide assistance to homeowners. We partnered with Global Green and USGBC LA to share information on the Thomas Fire Green Rebuilding Resilience Initiative, which will provide free, one-on-one green re-building/repair education and technical assistance to the residents of Ventura and Santa Barbara counties. The goal is to implement baseline green building strategies focused on energy efficiency, water savings, indoor air quality, and resilience and to increase the number of certified green homes in the area using the LEED for Homes (or comparable) standard. The program is just launching, and we were excited by the positive responses we received from residents during the event (Charlotte Will 2018). Interested homeowners filled out a short survey, so we could learn more information about their unique interests and needs. Our volunteer, green building experts—from the USGBC network—will use this information to help homeowners navigate the green building and resilience strategies and green building certifications available to them (i.e. Passive House, LEED, Living Building Challenge, etc.) as well as the rebates and incentives. If you're interested in participating in the program, please take the survey, click here! We also brought out our BuildSMART trailer for those interested in learning about sustainable materials that they can use within their house. To learn more about our trailer and for a list of materials, click here! Keep a look out on the CCGBC calendar for upcoming Re-build workshops this Summer and Fall! Here at Studio 2G Architects, we are committed to advocating and implementing green design, green building materials, and green lifestyles as the standard for our practice. Our latest project, See Canyon does nothing but follow suit. 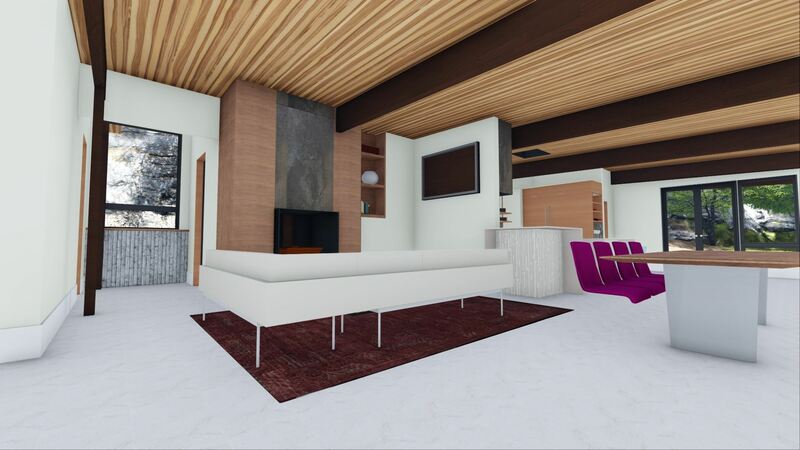 This project is a remodel of an existing 1800 SF residence. We demolished the entire home, but kept the original redwood siding to be re-used as an interior finish on some focal walls. We kept the existing slab to limit any undo site grading and to conserve natural resources from having to produce a new concrete slab. The perimeter of the existing slab will be insulated. Surprisingly, the original walls were not insulated. The new walls are insulated with blown in cellulose insulation and the exterior finish now a fire rated exterior siding. The new roof is now one complete line with a shallow pitch to maximize the PV panel placement. The plate height was raised to allow more solar access through the front windows for passive heating in the cooler months. We created an overhang to allow shading of the windows in the warmer months. The floor plan was rearranged to allow more of an open area for entertaining. We kept one of the original three bedrooms for a guest room, converted one bedroom to an office while creating a master suite. The owner valued clean lines and a direct connection to its nestled location. The home site was built right up to a steep, natural, rock outcropping. 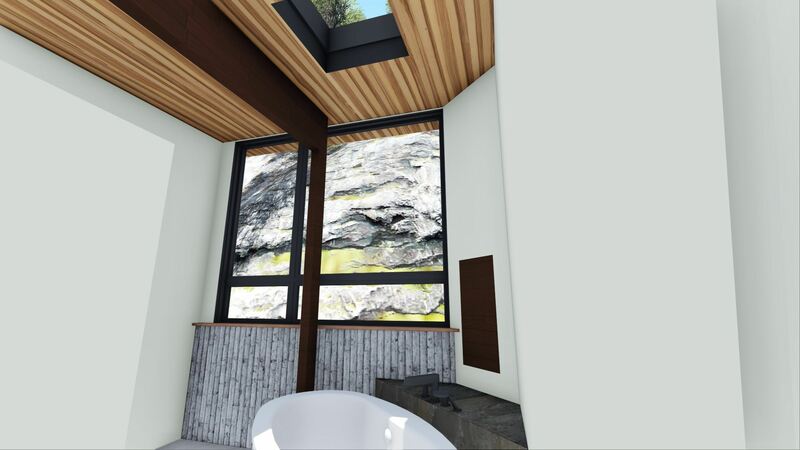 Our design has large windows looking out into this rock outcropping which allows the home to experience the natural environment. Additionally, it allows these North facing windows natural daylighting that carries itself deep into the space. Simplicity and clean design are paramount for this home. A modern roof design was implemented, with exposed glue-lam beams which span the width of the interior right out to the exterior. Walls that previously obfuscated a panoramic view were replaced with floor-to-ceiling line windows. Custom built-ins, made of reclaimed redwood, take the place of excessive amounts of furniture normally used for storage. All hardware fixtures are hidden so any exposed cabinetry lies flush, blending into the design seamlessly. Studio 2G received one of CCGBC's Green Gala awards from us back in our founding year of 2008, and have been connected with us through membership since 2011!! 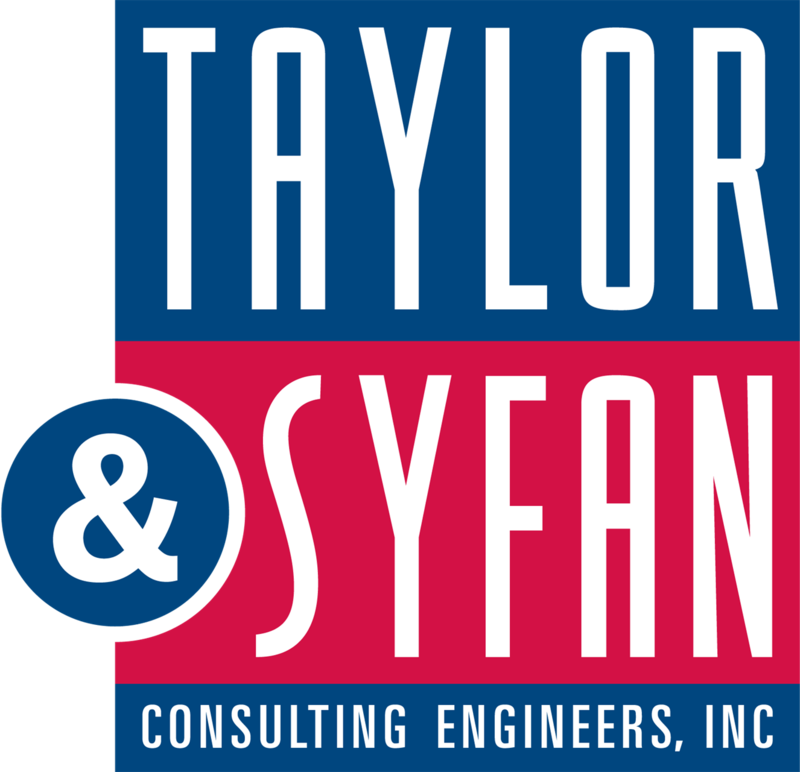 We are grateful for their recent 2018 Silver sponsorship and inspired by the sustainable practices that they implement into their work as leaders in sustainable building. Both principals hold LEED®AP B+C accreditation. On April 23rd the California Department of Education announced the 2018 California Green Ribbon Schools Award honorees. Carrisa Plains Elementary in the Atascadero Unified School District received Silver Level recognition. It is the second school in San Luis Obispo County to earn a Green Ribbon School Award. Carrisa Plains is unique because it is a very small rural school with the ability to create the school environment that they envision. They show commitment across all three of the Green Ribbon Pillars. Carrisa Plains has an updated facility that is energy efficient and powered by an onsite array of solar panels. Water use in the garden was reduced after the installation of rain barrels, made possible by a grant from the Gateway to Green Schools program. The rain barrels we purchased with the gateway to green schools grant, Todd Hansen presented the check to thr principal at an Atascadero school board meeting in Feb 2017. Waste is reduced through using refillable water bottles, recycling, and composting food waste from lunch in worm bins. Although biking to school is not possible at Carrisa Plains, students learn how to safely ride bicycles through a partnership with SLOCOG and the Safe Routes to School programs. Green School's Committee member Sarah Trauger from SLOCOG and Rideshare worked with Carrisa on setting up the bike safety programs. Carrisa Plains has six bicycles, holds annual Bike Rodeos, and is installing a Bike Garden this Summer. 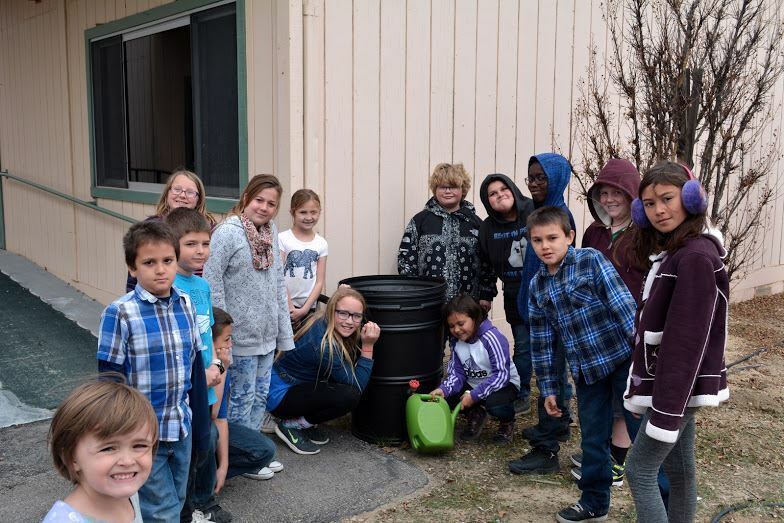 Carrisa Plains students using the school’s rain barrels purchased with a grant from CCGBC! Carrisa Plains has several policies in place to maintain the health of the human population as well as the environment. Cleaning chemicals are used sparingly, purified drinking water is provided, physical education includes the use of: bicycles, disk golf equipment, and yoga mats. Students learn to care for their own bodies through nutrition presentations and cooking in the school kitchen. They learn to care for the environment through their work in the school garden and composting system. Students at Carrisa Plains receive most of their environmental education in the school garden. All grade levels share responsibility for maintaining the garden beds, greenhouse, chicken coop, and composting system. In 2015 or 2016 One Cool Earth, a Green Schools partner organization, helped to set up their composting system. This hands-on experience is paired with an inquiry based online curriculum called Mystery Science. 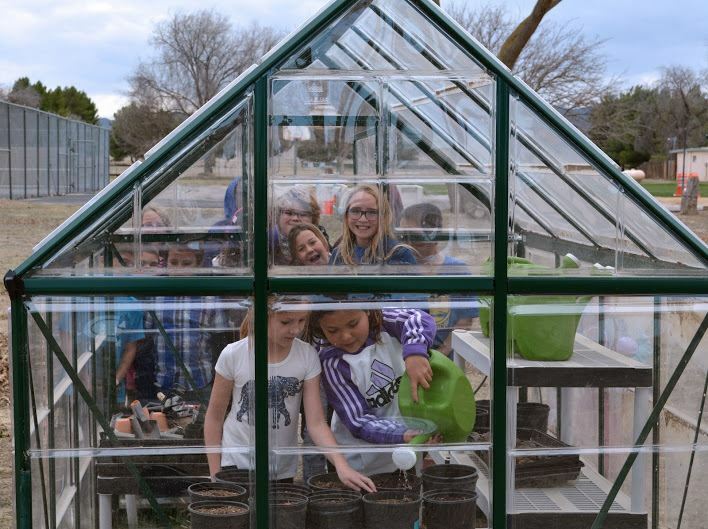 The students love working in the school’s greenhouse and learning to grow their own food! Green Schools promotes the school's achievements by putting up display boards at various events like the Monterey Road showcase, STEAM ally at Farmers in SLO, and Earth Day. Last year the display boards of all the various school's achievements went on tour so that the school's could share the accomplishments with anyone who spent time on campus. If you are involved in a school that could use some sustainable improvements of any kind, or is already an awesome school that deserves recognition -- get in touch with our Green School's Committee by emailing admin@ccgreenbuilding.org and they will help to guide any next steps. Amanda works with Gateway to Green Schools as a Green School Committee member and also works for the Cuesta Sustainability Resource Center as the Sustainability Education Specialist providing NEED science kits on renewable energy for K-12 public schools in San Luis Obispo County. Monterey Road principal Julie Davis and Amanda consulted on Carrisas 2018 Green Ribbon.Amanda represented at the awards announcement in April 2018. Saving water in California has been stressed time and time again through the twenty-first century, and we’ve heard countless tips over the radio or on the news on how to be more water conscious. Now, we have programs like LEED to help guide construction and building renovations to be more efficient from the start. In the upcoming years with the implementation of zero net energy construction in California, water use reduction and water efficiency will become an even more vital factor in building construction and renovation. Building designers and contractors will need to consider the design of a building from the get-go, using on-site resources and looking at synergies between systems to provide for the occupants with minimal additional energy requirements. Improving water efficiency is a crucial factor in helping your building achieve ZNE and LEED credits. According to the State of California Energy Commission, 19% of California’s total energy consumption is used to treat and distribute water (1) , making multiple levels of water metering and aerated low flow fixtures essential in identifying water usage issues and leaks, and reducing total water consumption. Being overall conscious about the sourcing and use of water in your building (via multi-level water metering) contributes to your LEED scorecard, while reducing water demand through methods like aerated, low flow fixtures reduces the energy associated with its transport, heating and cooling, proving beneficial for Zero Net Energy standards. 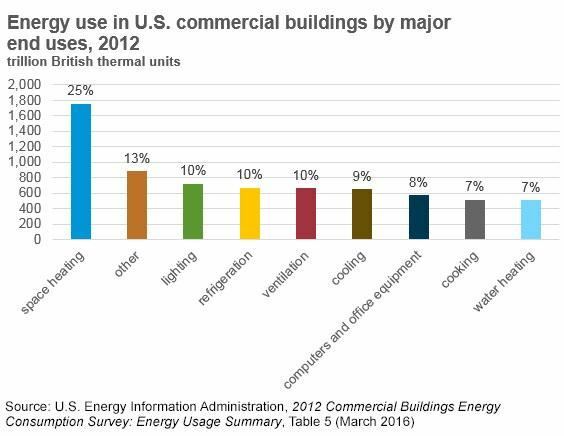 Water heating alone can account for 7% of a building’s energy usage, so utilizing tools like electric-powered heat pump water heaters in conjunction with low flow fixtures in showers can make a substantial impact on buildings’ total energy use. Depending on your location, the US department of Energy recommends electric-powered heat pump water heaters as the most efficient, and most cost effective, method of water heating over a 13 year period. A powerful feature of these water heaters is their ability to be incorporated into the building’s ventilation system to reduce energy demands associated with cooling, a task that accounts for 9% of a building’s total energy use. The location of your heat pump water heater can be integrated into the design of your building from the start. Placing a heat pump water heater in an area expected to be significantly exposed to heat will not only improve the efficiency of the heat pump water heater, but also help reduce the temperature of that area of the building, further reducing energy demands for cooling. Water metering, low flow fixtures and heat pump water heaters will help reduce the amount of total water used and the energy demand of using that water, but a rainwater management system can help reduce the amount of potable water used by your building. Rainwater management serves a dual purpose of reducing potable water use, and reducing runoff and pollution from your site by harvesting and naturally purifying it. Using rainwater for irrigation eliminates excess surface runoff by capturing the excess water during storm events, then releasing it slowly over time for irrigation. Irrigating with this water reduces pollution to the environment because the pollutants in rain are seen as nutrients by plants so they take them up and convert them to biomass. These systems are a true win-win to reduce potable water use and benefit the environment in a positive way. The recommendations made for commercial buildings hold true for residential applications. Low flow toilets and aerators in faucets give the illusion of high-flow feelings while realistically reducing the amount of water we use throughout the day. 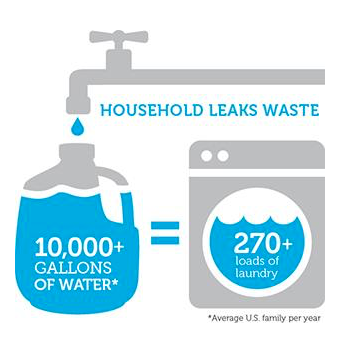 Look for the WaterSense label on sink fixtures, shower heads, and toilets or Energy Star labels for appliances. The WaterSense labels ensures that the fixture is both highly efficient, and high performing so that the efficiency of the fixture does not come at the cost of performance. According to the Grace Communications Foundation, the organization who took charge in creating the water consumption calculator, toilets made before 1996 used 6 gallons per flush (gpf) (2) while modern toilets (are required by code to use a maximum of 1.6 gpf, and some WaterSense toilets use as little as 1.28gpf with dual flush options using even less) have improved their efficiency to use only 1.5 gallons per flush. This is a great example of how modernizing your home can significantly reduce the water wasted throughout our days, saving money and reducing potable water that is, literally, going down the drain. Simple appliance upgrades produce monumental savings fiscally and resourcefully. Shifting our focus to outdoor water consumption, the leading contender for water waste, sometimes responsible for 80% of all home water use, goes unsurprisingly to the maintenance of our landscapes. (3) Shifting landscape vegetation away from water-dependent grasses and nonnative species to native, drought-resistant species reduces the water needed for upkeep while adding a more vibrant palette to the landscape. Dressing your yard in California Yarrow, Arroyo De La Cruz Blue-eyed Grass, and Tidy Tips flowers contributes to the visual appeal of your yard while saving you a large chunk of change spent on watering your lawn, and simultaneously diverts 25,000 gallons of potable water annually from being wasted. Exploring harvested rainwater or grey water systems for non-potable uses, like irrigation outdoors, is another step in the right direction of minimizing outdoor water consumption. We see two main points in reducing water use and increasing efficiency: behavioral changes, and infrastructural upgrades. Both of these aspects can have huge impacts on both savings and energy used in commercial buildings and in the home. Simple changes like switching the type of fixtures of sinks can make monumental savings both fiscally and resourcefully, and larger upgrades like greywater, reclaimed water, and rainwater systems lead to huge saving over the course of their life cycles. Authors Daniele Burns and Brian Wallin are students from the UCSB undergraduate program. The U.S. Department of Education announced on May 16th that Monterey Road Elementary School in Atascadero is among the 2018 U.S. Department of Education Green Ribbon Schools award honorees! 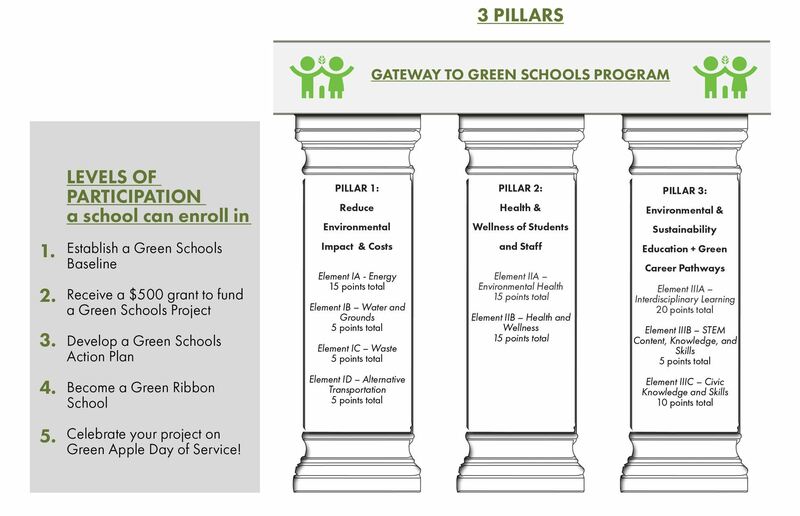 According to Sarah Trauger, the transportation specialist for the school, the Safe Routes to School Program touches on each of the three pillars of the Green Schools Program. A bike safety course and the California Pedestrian and Bicycle Safety Curriculum was implemented for Grades 4 and 5 to Pillar 1: Element ID – Alternative Transportation. Bicycling and walking are the epitome of alternative transportation. Second, biking and walking are clearly related to both of the elements found in Pillar 2. When students learn bike and pedestrian safety at school, and learn to use them as a means to get to school, the reduction in greenhouse gases and decreased use of automobiles on our roads, aides in our environment’s health (Element IIA). Additionally, when students ride bikes and walk to school, their own health and wellness will improve too. Within the Curriculum, students prepare a plan for scheduling 60 minutes of physical activity into their daily lives and explore the health benefits of physical activity. Less apparent than the others, the use of the and California Pedestrian and Bicycle Safety Curriculum for Grades 4 and 5 within the Safe Routes to School Program, teaches bike and pedestrian safety in a way that draws on other subjects students are learning in school, especially math. Students spend time learning how to calculate and reduce the amount of air pollution emitted each day (Element IIIA – Interdisciplinary Learning and Element IIIB – STEM Content, Knowledge, and Skills). Lastly, using the Curriculum, students learn civic knowledge and skills (Element IIIC), with lessons on: rules of the road, where students learn about pedestrian and bicycle safety laws and consider real-life scenarios where these laws apply; traffic signs, where students identify the meaning and importance of traffic signs; silent safety, signals where students learn how nonverbal communication helps people stay safe while walking and bicycling; and safety factors, where students examine factors that affect pedestrian and bicycle safety and assess the safety of their routes to school. Monterey Road’s garden, outdoor classroom area, food forest, and native plant habitat uses over 19,000 square feet, which is about 5.5 percent of the school grounds. All planters and a grassy slope have been converted to native plant habitat by students. One planter is a devoted butterfly garden used for educational purposes. Lawn areas are used as an extension of classrooms. Students were involved with all steps of the process to design, construct, and now maintain the food forest, which is intended to function like a forest ecosystem with five fruit trees, vegetable plants, California natives, herbs, and berries that provide food and an additional educational space for students. The food forest is used as another outdoor learning space where lessons are taught in connection with the California Next Generation Science Standards (NGSS). The main garden site at the school includes 23 raised beds, a wheelchair-accessible bed, three student-designed brick beds, and various planters. Produce from the garden is served in the cafeteria, sold on Mondays at a mini-farmers market, and donated to a Wellness Kitchen for use in meals prepared for cancer patients. Students learn general garden maintenance that supports life science lessons through planting seeds, harvesting, collecting seeds, and composting. Students develop problem-solving skills when deterring gopher activity and designing weather protection. The Caring Schools Community program at Monterey Road is a program that builds classroom and schoolwide community while developing students’ social and emotional skills and competencies. In addition, students have daily access to the school psychologist and biweekly campus visits from Paso Robles Community Centers counselors. Students participate in cooking lessons using food grown in the garden, and the third grade holds salad parties to eat what they harvest. Family cooking nights throughout the year give families the opportunity to cook healthy meals using produce from local farms and campus gardens (U.S. Department of Education Green Ribbon Schools: Highlights from the 2018 Honerees2018). "As a school, we have been committed to sustainability efforts for the last three years. Our students and staff are passionate to Outdoor Learning, Next Generation Science Standards and implementing practices throughout our campus that reduce waste. This award was made possible because of the amazing team we have in place. I am so proud of our school and know that we will continue to improve our efforts in the years to come!" Amanda Shere worked as a partner with Monterey Road where she provided the teachers with hands on science kits from the National Energy Education Development (NEED) Project as well as being the lead author of all 3 of their Green Ribbon applications. Here is what she had to say about the latest achievement. "The National Green Ribbon School Award that Monterey Road received has been several years in the making and I know it means so much to all involved. I attribute their success to the commitment of the whole school to be more sustainable, especially the students, as well as the support of the District Office. I am proud to be a partner of Monterey Road Elementary and I offer my congratulations to them on receiving the award. " Across the country, 46 schools, six districts, and six post secondary institutions are being honored for their innovative efforts to reduce environmental impact and utility costs, improve health and wellness, and ensure effective sustainability education. The list of all selected schools, districts, colleges, and universities, as well as their nomination packages, can be found here. A report with highlights on the 58 honorees can be found here. More information on the federal recognition award can be found here. Resources for all schools to move toward the three Pillars can be found here. ED's award is called "U.S. Department of Education Green Ribbon Schools" and has "District Sustainability Award" and "Postsecondary Sustainability Award" categories, in addition to the original school award. It is abbreviated ED-GRS. "Green Ribbon Schools" without the "U.S. Department of Education" is not ED's award, but instead is a separate program overseen by another organization. A selected school is a "2018 U.S. Department of Education Green Ribbon School." A selected district is a "2018 U.S. Department of Education Green Ribbon School District Sustainability Awardee." A selected postsecondary institution is a “2018 U.S. Department of Education Green Ribbon School Postsecondary Sustainability Awardee. There is no "National," “Award,” or "Program" in the title. There is no apostrophe or hyphen after Education. 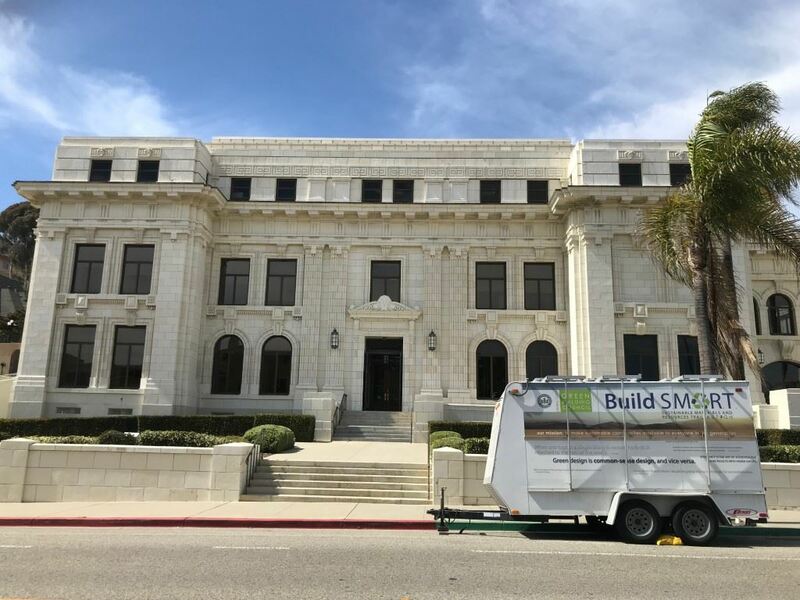 Did you know that the USGBC BuildSMART Trailer at the Ventura Earth Day Eco Fest was powered entirely by non-toxic batteries from Ojai-based SimpliPhi Power? It only took one PHI 3.5 kWh battery to ensure that the USGBC never lost power during the festival. SimpliPhi storage can be charged with any energy source -- solar, wind, grid power or a generator -- and can provide hours of silent, safe, non-toxic electricity. SimpliPhi combines non-hazardous LFP energy storage chemistry with its proprietary cell and battery architecture, power electronics, Battery Management System (BMS) and assembly methods to create safe, reliable, durable and highly scalable on-demand power solutions for the residential, commercial, military, emergency response and film industries. Integral to all SimpliPhi solutions is a proprietary management system that further optimizes the life-cycle, performance and durability of its batteries. SimpliPhi storage system components are UL certified and have been rigorously tested and passed requirements by the U.S. Army and Marine Corps with a zero failure rate. SimpliPhi’s energy storage and management systems have now been deployed in 30 countries and the company’s solutions have been used by hundreds of California residents and businesses, as well as government agencies, charitable organizations and well known corporations such as FEMA, Snapchat, NBC, Fox Studios, Disney, Paramount, LADWP, USAID, Direct Relief, Airbnb, Kithaus, Red Bull, Whole Foods, the US Military, and most recently, California Governor Jerry Brown. Why does it make sense to consider energy storage for your home or business? Without energy storage, renewable sources of power are intermittent, but so too is the grid in emergency and blackout scenarios when the centralized delivery of power breaks down. For home and business owners who have installed solar, energy storage allows you to future-proof solar savings, particularly in the event of a utility rate change, by storing the solar when the sun’s shining and using it at a time when utility rates are high and the sun isn’t shining. Perhaps most importantly, any California resident or business can use energy storage to ensure reliable power and resiliency in the face of a natural disaster. There are 3,879 power outages on average in the US each year, and they have only been increasing since 2012. SimpliPhi customers were able to maintain power during last year’s wildfires, including at the Stone Edge Farm Microgrid, which withstood the recent Northern California wildfires and power outages. The Stone Edge Farm Microgrid served as a community center during this disaster, allowing neighbors to charge necessary devices when no one else had access to power. In addition to continuing to power each building, the Stone Edge Farm Microgrid was even able to pump water to fight the fires. 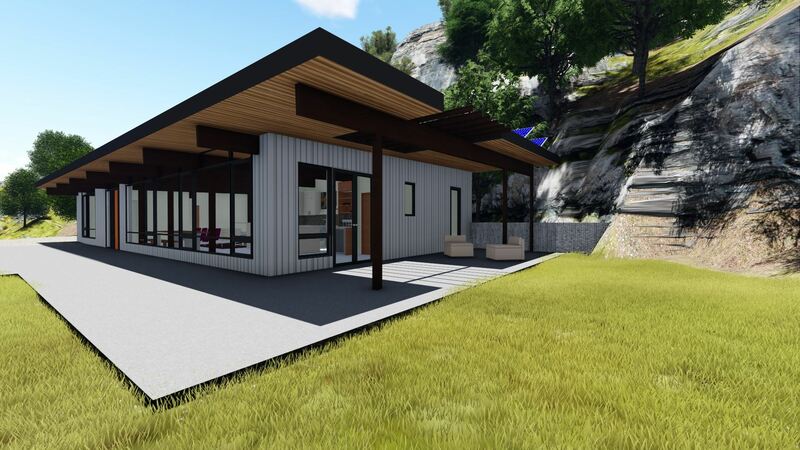 After the fires, SimpliPhi’s solutions have also been deployed in prefabricated, manufactured homes by homeowners looking to rebuild their homes in a more sustainable, efficient way. If you're interested in exploring energy storage, mobile power or emergency power solutions for your home, business or recreation, visit SimpliPhipower.com and follow us on Twitter, Facebook, Instagram, YouTube and LinkedIn. These five are also California’s "Green Achievers," the highest honor in the California Green Ribbon Schools recognition program. Details on each California nominee are below. 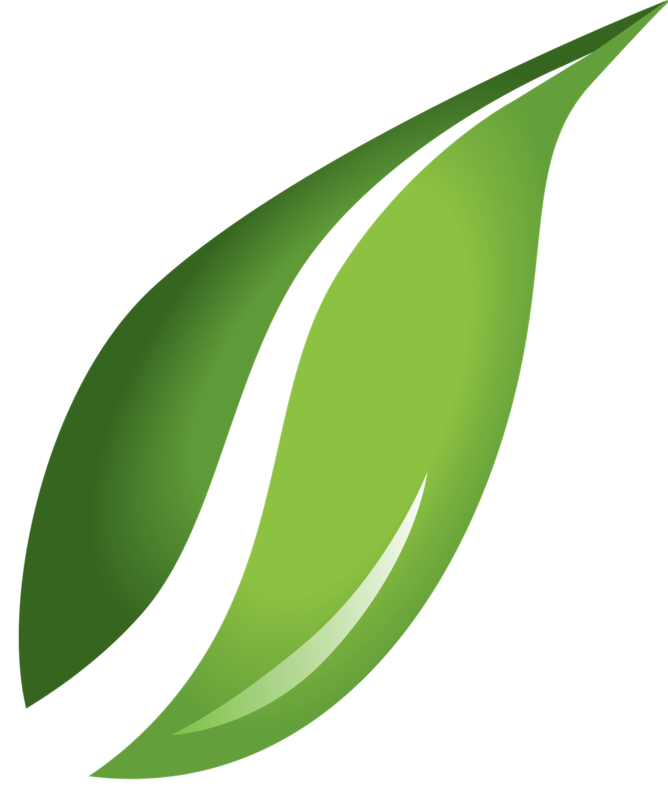 For more information, please visit the California Department of Education's Green Ribbon Schools Award Program Web page and download A Blueprint for Environmental Literacy: Educating Every Student In, About, and For the Environment (PDF; 1.4 MB). At Jack London Community Day School, sustainability is not only about the environment, it’s about empowering students to become positive agents of change through environmental citizenship. In 2013, the school put sustainability principles into action by converting an 18,000-square-foot asphalt parking lot campus into an urban, edible garden for the community. Science and horticulture curriculum are integrated into a single four-year Career Technical Education pathway combining environmental science and sustainable landscaping. And urban horticulture is taught as a way to meet the needs of an increasingly urban environment without compromising the ability of future generations to meet their needs. Monterey Road school programs promote exercise, positive school climate, sustainability, and garden time—all integrated across the curriculum. The campus was modernized in 2012 and energy use was reduced by 70 percent over the following five years. Monterey Road has also reduced the use of chemical cleaners by using microfiber cloths for cleaning. The school began an annual student-led waste audit in January 2015. All students separate lunchtime waste into compost, liquid, recyclable, and landfill bins. Students were involved with all steps of the process to design, construct, and maintain the school’s Food Forest, which is designed to function like a forest ecosystem with fruit trees, vegetable plants, California natives, herbs, and berries. The Food Forest is used as an outdoor learning space where lessons are taught in connection with the California Next Generation Science Standards. Tahoe Truckee Unified (TTUSD) has a long history of conservation efforts to reduce energy and water use, dating back to 2002 when the district adopted cool-roof standards. The District’s first green building project was Alder Creek Middle School, which received Collaborative for High Performance Schools (CHPS) verification in 2005. All current projects are designed to LEED Silver standards. A “Farm-to-School” district, salad bars utilizing locally-grown produce are located at all sites. Since 2006, TTUSD has implemented the Harvest of the Month program, which features California-grown produce for the purpose of engaging students in the world of agriculture and nutrition. Top of the World Elementary (TOW), nestled in the hills of Laguna Beach, has always had a focus on developing environmentally and socially conscious students by providing opportunities for them to make positive impacts locally and globally. There are three onsite gardens used as outdoor classroom spaces, an 18-foot geodesic dome greenhouse, and outdoor cooking stations. During the 2016–17 school year, students spent a combined 10,000 hours learning outdoors. TOW uses digital devices and do many assignments online to save paper. PTA, principal, and district announcements are all sent digitally, reducing paper waste. Students also use the solar power generated from a solar array on the shed roof to power a blender and make smoothies, and collect weather data for analysis through a school-wide WeatherBug system on building roofs. Maple Village Waldorf School (MVWS) opened in 2007 with a three-pronged philosophy: having little to zero waste, lots of outdoor time, and a reverence for others and the environment. The school’s STEM by Nature initiative trains and supports teachers in the use of the natural world, school grounds, and field trip experiences to teach STEM content and skills. Teachers use environmental phenomena to engage the students in inquiry-based lessons. 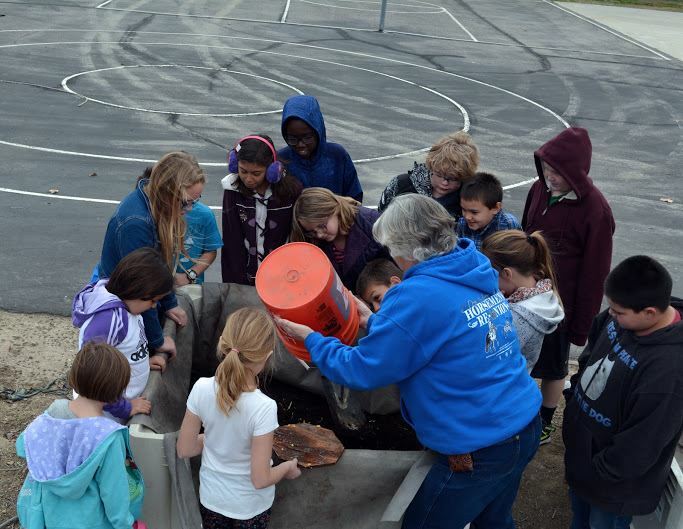 Through activities such as composting, rainwater capture, and gardening, students use the school grounds and surrounding community to deepen their understanding of the natural world. The California Department of Education is a state agency led by State Superintendent of Public Instruction Tom Torlakson. For more information, please visit the California Department of Education’s Web site. You may also follow Superintendent Torlakson on Twitter, Facebook, and YouTube. The Ventura County Regional Energy Alliance (VCREA), in partnership with the Community Environmental Council (CEC-SB), are launching their newest pilot program, kWh Countdown, funded by the California Energy Commission. kWh Countdown offers two primary services for businesses located in the cities of Thousand Oaks, Ventura, and Moorpark: 1) free energy benchmarking to all business that enroll; and 2) a limited number of comprehensive energy audits to businesses that demonstrate a willingness to invest in energy efficiency projects. These services offered through kWh Countdown are designed to help businesses save money on utility bills and invest in energy efficiency projects with confidence. The level of audit that businesses will receive are typically valued at over $5,000. Businesses are encouraged to apply as soon as possible as there are ample funds for audits and benchmarking for new participants. There will be two kWh Countdown programs: Ventura County kWh Countdown (cities of Ventura, Thousand Oaks and Moorpark) and Lompoc kWh Countdown (City of Lompoc). Funding for each program is provided by the California Energy Commission. The Lompoc kWh Countdown program has an auditing budget of $70,000, whereas the Ventura County kWh Countdown has an auditing budget of $90,000. If interested, you can visit http://www.kwhcountdown.org/ for more information about how to bid into this RFP.